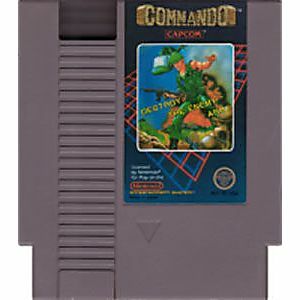 Commando original NES Nintendo Game cartridge only - Cleaned Tested and Guaranteed to Work! 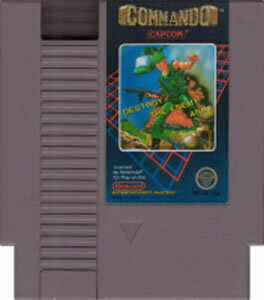 One of the original overview (top down) shooting games. Although not nearly as superior of the arcade version, it is still worth a look. Your character has a rifle with unlimited ammo along with finite amounts of grenades that can be replenished throughout the stages as you kill bad guys and save hostages. While I personally prefer Gunsmoke, this is still a great game worth the price. Very cool and very fun game.Can play this game for hours.What a classic! Thank You Lukie Games. 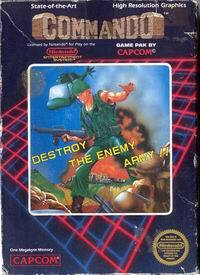 I bought this because I love Bionic Commando and this is from the same series(ish). The cross pad isn't as useful as an NES Max or Advantage would be to control this. Dropped off by helicopter you must work your way up the battlefield while shooting enemies as they run at you and lobbing grenades over sand bags to take out stationary machine guns. Over all i give this game a good amount of praise for replay value and style.